Play Irondog Slots for free and read reviews of their games. Click here to read more. 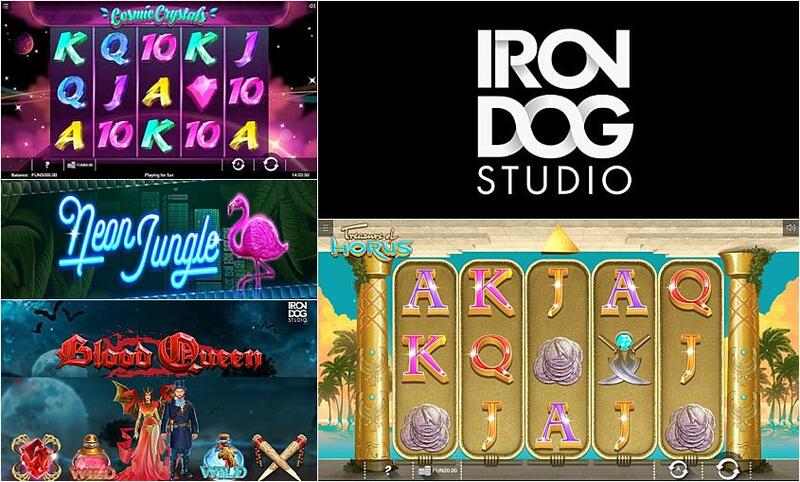 Iron Dog Studio is a new online slot developer that aims to create new content to entertain and engage players at online casinos around the world. The team takes a ‘build for the future’ approach to game design, which makes use of the latest technological advancements in the development to cutting-edge slots games. Iron Dog will be making a splash in the online gaming market, and online casino players are eager to see the kinds of exciting new innovations this studio brings to the table. Launched in 2017, Iron Dog is part of the 1X2 Network, which burst on the online gaming scene 2002 with the introduction of Virtual Football products. The company aims to be on the forefront of mobile gaming innovations with 40 HTML5 games in addition to its Flash portfolio of 100 casino games. The major benefit of being part of the 1×2 Gaming network is the Iron Dog will have a wide distribution network. You can find 1X2 slots at nearly 100 of the best online casinos across the web, and Iron Dog will see similar distribution through NYX OGS platform. You can expect to see Iron Dog slots at world-class gaming destinations like Royal Panda. Gifts of Ostana: With a stunning fantasy theme that approaches Easter holidays in a unique way, this 20-payline online slot offers up a huge range of bonuses like free spins, multipliers, sticky wild reels and re-spins. Cherry Blast: This 20-payline slot features a retro theme with a fun bonus game that plays out just like a round of Pac Man. Paint: This vibrant slot features impressive graphics and a fun art theme, with a pick-a-prize round and a free spins bonus. Cosmic Crystals: This is a dazzling 50-payline slots game that offers up plenty of generous winning potential with re-spins, expanding wilds and free spins. You’ll also find impressive table games from Iron Dog at online casinos. 3D roulette is expected to be a hit among players with more traditional gaming tastes, while bringing something new and innovative to classic table games. You can give Iron Dog slots a spin using just about any mobile or desktop device. The games are developed using HTML5 technology, so you can play them right from your web browser without the need to download any software. Optimised for screens of all sizes, you’ll have the same great gaming experience on Iron Dog slots whether you play on a smartphone or a tablet. Iron Dog games are also cross-platform titles, which means they will run on Windows, iOS and Android operating systems.